UC-HIPACC supports an annual school aimed at graduate students and postdocs who are currently working in, or actively interested in doing research in, AstroComputing. Topics and locations of the annual school rotate among the UC campuses and national laboratories, and Caltech and Stanford also participate. 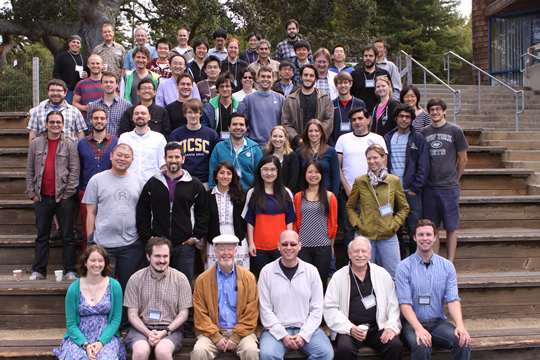 In July 2010, the first such summer school, focused on the topic of Galaxy Simulations, was held on the campus of UC Santa Cruz. In 2011, 28 grad students—17 from outside California—gathered to learn about Explosive Astrophysics, held at Lawrence Berkeley Laboratory. In 2012, the topic is to be Astro-Informatics, on the campus of UC San Diego. During all the summer schools, students were afforded direct access to some of the largest supercomputers in the world for running their own simulations. Previous high-level international schools in computational astrophysics held at the Astrophysical Institute Potsdam in 2006 and at the Princeton Institute for Advanced Study in 2009 evidenced high demand for such schools. Lectures from the UC-HiPACC summer school sessions are made available on the web so that they can be useful even to students who cannot attend the schools. In addition, the San Diego Supercomputer Center (on the campus of UC San Diego), Los Alamos National Laboratory, Lawrence Berkeley National Laboratory, and Lawrence Livermore National Laboratory all give tutorials on high-performance computing; moreover, HPC courses are being organized at several UC campuses. These tutorials and courses will be woven into the UC-HIPACC calendar, broadening them to a wider range of scientific and engineering areas.